Angry Birds Blast is the third match-3 game from Rovio. The first two games were Fight! and Stella. While Angry Birds Fight! was more of a competitive puzzler, Stella was a bubble popping game. Blast sticks to traditional match-3 mechanics with exciting new features sprinkled here are there. You will have to tap balloons of the same color to free birdies, defeat pigs by popping balloons beside them, save golden eggs and complete fun quests for rewards. Popping 5 matching balloons will create a rocket booster. Tapping it will launch a rocket that will rip through a row or column full of balloons. Before tapping a rocket, note the direction it’s pointing. If the rocket is pointing up, then tapping it will clear all balloons from bottom to top. If it’s pointing left, then all balloons will be cleared in a row, from right to left, when you tap it. The rocket changes direction every time you match two or more same-colored balloons. So in case you don’t want to remove a column, just match some balloons to change its direction. If there are two rocket boosters placed next to each other, then tapping any one will trigger a cross-shaped blast, clearing all balloons in a row and column. Popping 7 matching balloons will create a Bomb. When you tap a bomb, it will explode, destroying surrounding balloons. Tapping a bomb placed next to another bomb will create a bigger explosion, clearing several balloons at once. If there’s a rocket next to a bomb, then tapping any one of the two boosters will launch multiple rockets. These rockets will trigger explosions, removing almost half of the game board. Popping 9 matching balloons will create a Laser Gun. This booster takes the color of matching balloons. So if you tap 9 Blue matching balloons, a blue laser gun will appear on the board. Now tapping the blue laser gun will clear all balloons of that color (i.e. blue balloons). You are really lucky if you manage to bring both Laser Gun and Bomb/Rocket close to each other. Tapping on a laser gun or Bomb converts all same-colored balloons into bombs. So if the Laser gun booster’s color is red, then all red balloons scattered all over the board will turn into bombs and explode. If a Laser Gun and Rocket boosters are placed next to each other, then tapping any one of them will convert all balloons of the same color into rockets and clear rows/columns simultaneously. So if the color of the laser gun is blue, then all blue balloons will turn into rockets. Try combining a laser gun with another laser gun to see its effect on balloons. Lives are denoted by hearts, which can be seen at the upper right corner of the screen. When there’s only 3 or 2 hearts remaining, check how many minutes are left before the next refill. This will give you a hint as to how many minutes/hours should you move ahead to get back remaining lives. Here we are aiming for a full lives refill, so we will try to move the time ahead by at least 1 hour. If you try to be too accurate, say move the time ahead by 25 minutes or so as per the remaining time shown on the upper-left corner of the screen, then the trick won’t work when you set the time to “Automatic” again. 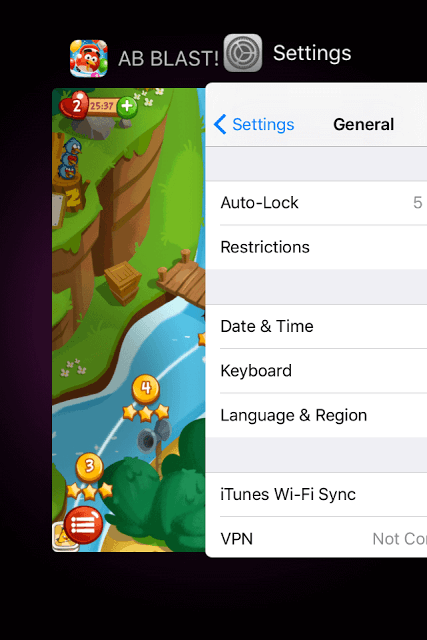 On your iPhone, keep the game open and double-press the home button. Tap the Home screen and go to “Settings”. Scroll down and tap “General”. Under General, Scroll down until you find “Date & Time”. Under “Set Automatically”, move the slider to the left side to turn it off. Now tap the Date and Time section under “Time Zone” and set it at least one or two hours ahead. Now double press the home button and tap the app. You will notice that all five lives have been refilled. Double press the home button again to access the date and time settings and turn on “Set Automatically”. Close the setting and enjoy! As of writing this guide, the time-lapse cheat is working pretty well, but then it might not work if there’s a new update. Use this cheat at your own risk. Tap the heart icon at the upper left corner of the screen. In the “Get Lives” window, tap the “Ask a Friend” button. This will let you request lives to online players. Try to request lives to all players as it will increases the chances of getting free hearts. I would also recommend logging in to Facebook so that you can also send heart request to your Facebook buddies. You can spend gold to get all fives lives. Gold is premium currency in this game so try to save the free gold you receive for getting all 5 lives. Don’t waste gold to get extra moves in case you fail to complete a level. You can earn gold by discovering new hatchlings in certain levels. You will get 25 gold by logging in to Facebook. What you should do is to send life request to online players when you have 5 hearts. Make sure you send requests to all players. Now, when someone sends a life, use it when you have 4/3/2 lives left. When someone sends a life, it goes straight to your mailbox (envelope icon). Tap the envelope icon on the right side of the screen to accept or reject lives sent by online players. Don’t press the red reject button, save those lives when you have lost some. When you lose a life or two, go to your mailbox and press the green accept button to add it to your total number of lives. On your Angry Birds Blast map, you may have seen adorable little birdies appearing on random level markers on the map. Completing levels where such “hatchlings” appear will let you complete a quest and earn rewards. Tap the quest icon, which is located just above the “Toons TV” icon on your map screen to access a list of quests. There are different types of hatchlings and some quests will need two different types of hatchlings. Once a quest is completed, the “collect” button will turn blue. 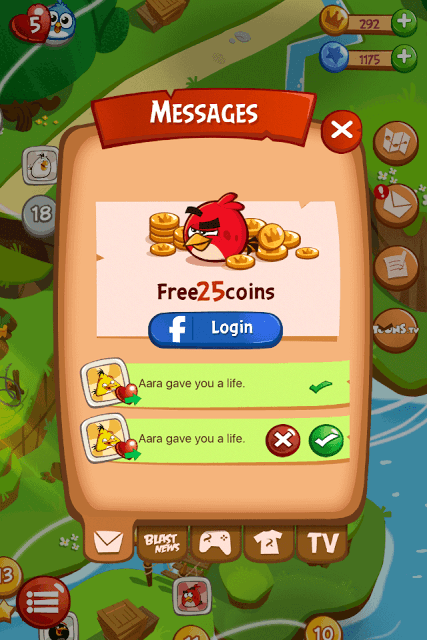 Tap the button to collect rewards like coins, gold and extra boosters. 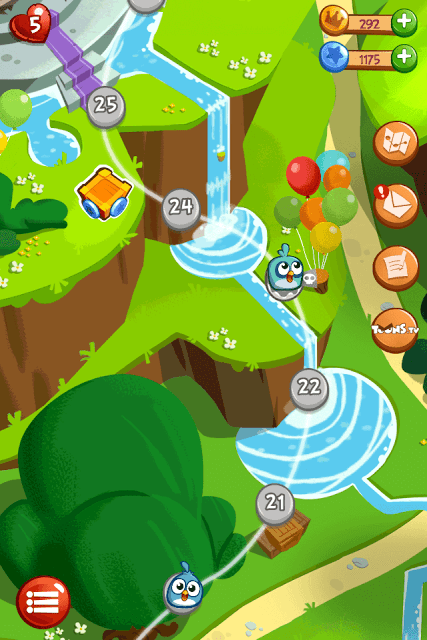 In levels where you will need to collect birdies, focus on matching those balloons that are same as a birdie’s color. So popping red balloons will let you collect red birds, blue balloons will let you collect blue birds and so on. If the game wants a certain number of yellow birdies, then you should focus more on matching yellow balloons. Ice blocks can be destroyed by matching balloons beside them. You will have to match balloons only once to destroy an ice block. But to destroy wooden blocks, you will have to match balloons beside it twice. Pigs can be defeated if you match 3 or more balloons beside them. But you will have to match balloons twice to make them disappear from the board. Even if you use boosters like the rocket for the first time on a pig, it won’t be defeated and will need another booster or a balloon match to be defeated. coins for boosters like bombs, extra moves etc. These boosters appear before a level starts. Select a booster by spending coins and that booster will appear on a random location on a game board. Play previous levels to get some coins. Although you won’t get many coins by replaying a level, but still there’s nothing wrong in replaying extremely easy levels like level 1 and 2 to get a few coins. The more stars you earn per level, the more coins you will get. So if you earn only 2 stars in a level, you will get 14-15 coins. But if you get three stars, you will receive at least 25-30 coins. The harder a level, the more coins you will earn. Look for the purple colored level markers on the map. Such levels are tough to complete, but offer more coins than others. Many thanks for your advice – have now progressed to level 119 . But had to buy gold coins to extend the number of moves for most games past 100. In your opinion, from which level of the game onwards are only really playable if one has to buy gold coins – I am sure the creators have built in a “ no win without spending money” level – easy levels to start with to catch the interest of players then – spend money if you wish to progress ? All levels are playable, but some levels are hard to complete. You can finish them, but on a trial and error basis. You can buy gold coins or just replay those levels several times. Luck plays a big part in such games since new balloons are randomly generated after you match balloons on the board. Use power-ups wisely and the more power-ups you combine (swapping adjacent power-ups), the faster you will reach your goals before you run out of moves. The problem with color matching games is randomness. 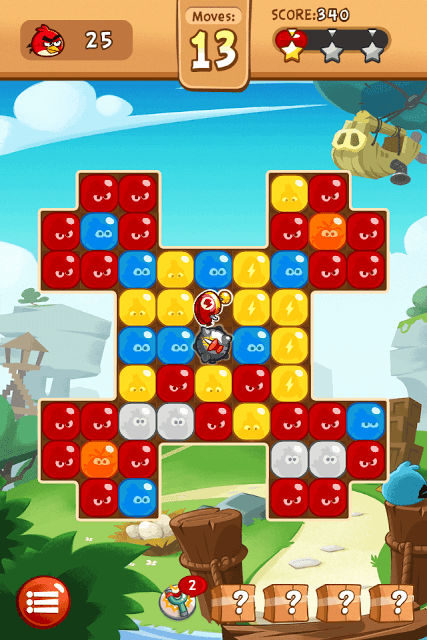 In this game, colored balloons are randomly generated on the game board, making it difficult for players to complete a level. This is why you will see different screen colors on another player’s game. Also, there’s always one level that’s pretty tough to beat. You can play it on a trial and error basis to win it if you don’t intend to spend real money on boosters or extra moves. In level 100, the key to win is to combine power-ups to create a bigger explosion. This will clear obstacles and you will save moves on clearing pigs and coloring bubbles red. Just make sure that there are no pigs in a column to turn all balloons into red. You can then match them to get lots of red birds. Even if there’s one pig in the middle of a column, then balloons after it won’t be colored red when paint is spilled. You will have to move the hot air balloons to the top of the game board until they are sucked by one of the 6 suction cups on the left and right side of the board. Pop 3 or more balloons of the same color above the hot air balloons to keep them moving up until they reach the top of the board and get swallowed by the suction cups. This is how you collect them. The suction cups are placed on the top of the game board. How do you make the paint bucket tip on level 78? It’s so frustrating! You will have to make use of rocket power-ups to make paint buckets tip. The rocket should zip through a paint bucket vertically or horizontally. Another way to make it tip is to pop balloons adjacent to it. A paint bucket won’t tip if there are pigs underneath it. There should be balloons below it. When a bucket tips, the paint colors all balloons of the same color. Note the color of the paint and make sure you pop balloons of a color different from the paint color. Popping black balloons adjacent to a paint bucket with black paint won’t make it tip. The 2 lasers have to be side by side; then just tap on one and…done! Maybe you will help me? While playing a level,there are Boosts,at the bottom,I Kno w how to use the Slingshot. But say I want to get 2 Lasers together,to wipe out the screen,How do you do it?